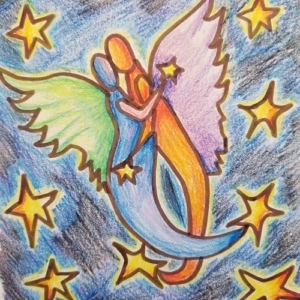 Several months ago, Marcy, my acutely perceptive Tarot Reader, spoke of the struggle we each have balancing our analytical, logical side with our intuitive, LOVE-centered side at different times throughout our lives. This is especially true when we are in the midst of great change. The masculine aspect of ourselves, associated with action, wants to DO something. The feminine aspect of ourselves just wants to BE. Marcy used the image of a uniformed guard putting great effort into “protecting” a stone building. He held a flag and took his job very seriously… to the point of exhaustion… not realizing that this much effort wasn’t really needed. The guard represents my logical side- some call it the masculine, ego, thought, left brain, or animus. At the same time, in this vision, a sleek female cat-burglar was sneaking past him into the building. She wasn’t gloating but she was definitely amused that she was able to sneak passed him undetected. Some call her the female, Intuition, spirit, heart, right brain, or anima. It’s an illusion to think each, acting alone, will be beneficial. They both need to stop their “game playing”, truly SEE each other, and know that when they unite, they will be able to fulfill their true purpose- provide balance. Marcy saw the cat-burglar go outside and make the first gesture toward connection. He wasn’t able to do it; he was too focused on his duty to guard and protect. The guard didn’t realize that by joining forces with her, it would free them both. She embraces him and he literally lets his guard down- weeping and awakening at the same time. The cat-burglar, too, realizes the need for unity to fulfill their symbiotic roles. What is fascinating to me, beyond Marcy’s skill as a Tarot reader, is that this message was already coming to me loud and clear through my creative expression. Creativity is where I’m most comfortable letting go of expectations and outcomes, allowing my Intuition to guide the process and analysis to follow. Intuition communicates most clearly through imagery, synchronicity, dreams, and most often my art. 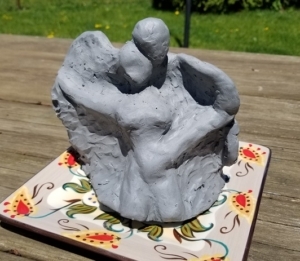 The beings in both my sculpture and my colored pencil drawing depict the positive effect the unity of masculine and feminine energies can have when they are in harmony. Marcy went on to explain that our outer world mirrors our inner world. Relationships with others and our experiences inform us of the times we are living in balance and when we are not. Balance, for me, feels like greater clarity and flow, bring to mind words like Trust, Allowing, and Surrender. When the masculine and feminine are out of balance, I feel discord between my heart and throat chakras- the centers for love and communication. 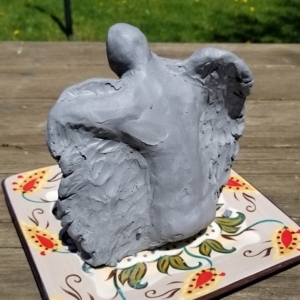 To come back to center, I have to form a harmonious partnership between the rigid, analytical aspect that is most comfortable “DOING” and the intuitive, heart-centered aspect that finds comfort in “BEING”. Seeking balance between Doing and Being, I treat myself with greater compassion, gentleness, and kindness. In my Tarot reading, Marcy saw the cat-burglar make the first move toward the guard. By holding him in her arms, she represents taking a LOVE-focused approach. 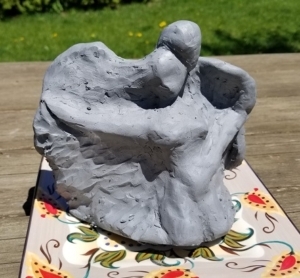 My intuitive art practice, meditation, connecting to nature, and time for dream-filled sleep entwine these two aspects of my Self. From this place of unity, I can move forward with greater grace, serenity, confidence, and love. That’s when I know I’m on the right path. What do you do to bring balance between DOING and BEING? How can your Intuition be given space to guide you more often? When you are still and quiet, what is your heart saying to you?